Sometimes when invoking a web service, we may be interested in retrying the operation in case an error occurs. When using Spring Integration, we can achieve this functionality with RequestHandlerRetryAdvice class. This class will allow us to retry the operation for a specified number of times before giving up and throwing an exception. This post will show you how to accomplish this. The source code of the application can be found at my Github repository. You can also get the source code of the web service project that is called by the application at my Github repository. Use case: The client invokes the web service and receives a response. 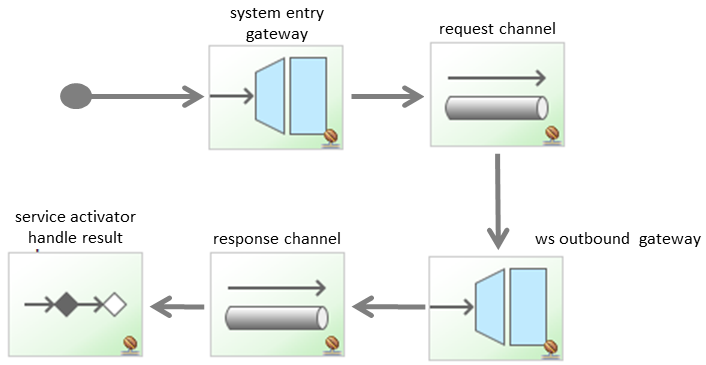 The request enters the messaging system through the “system entry” gateway. It then reaches the outbound gateway, invokes the web service and waits for the response. Once received, the response is sent to the response channel. Mapped to the response channel there’s a service activator which just logs the result. With this configuration, if the service invocation fails, a MessagingException will be raised and sent to the error channel. In the next section, we will add the retry configuration. Use case: The initial request failed because the service is not active. We will retry the operation until a response is received from the service. Now the web service outbound gateway will delegate the invocation to the retry advice, which will try the operation as many times as specified until it gets a response from the service. To accomplish its objective, the advice uses a RetryTemplate, which is provided by the Spring Retry project. We can customize its behavior by defining backoff and retry policies. FixedBackOffPolicy: Used in our example. It will wait for the same specified amount of time between each retry. ExponentialBackOffPolicy: Starting with a determined amount of time, it will double the time on each retry. You can change the default behavior by establishing a multiplier. SimpleRetryPolicy: Used in our example. Specifies a retry attempts limit. ExceptionClassifierRetryPolicy: Allows us to establish a different maxAttempts depending on the exception raised. TimeoutRetryPolicy: Will keep retrying until a timeout is reached. Use case: The service won’t recover, storing the request to the database. 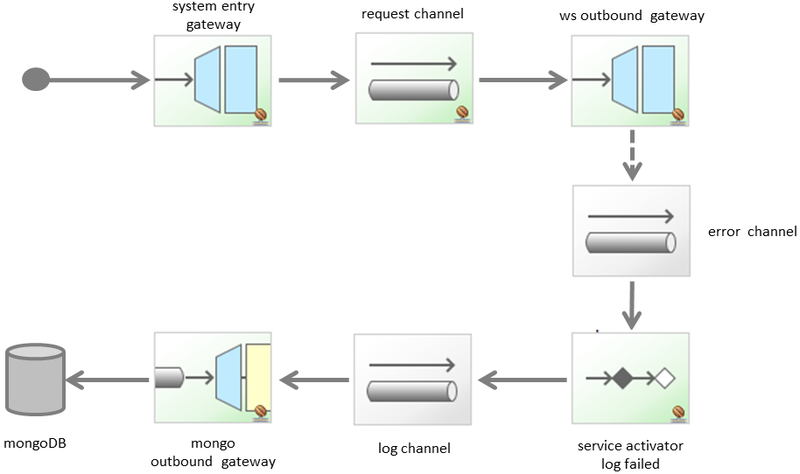 The service activator subscribed to the error channel will retrieve the failed message and send it to the outbound adapter, which will insert it to a mongoDB database. We’ve learnt how Spring Integration gets support from the Spring Retry project in order to achieve retry of operations. We’ve used the int-ws:request-handler-advice-chain, but the ‘int’ namespace also supports this element to add this functionality to other types of endpoints.